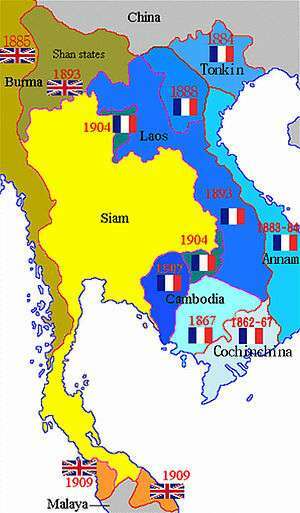 The Franco-Thai War (Thai: กรณีพิพาทอินโดจีน French: Guerre franco-thaïlandaise) (1940–1941) was fought between Thailand (Siam) and France over certain areas of French Indochina. The German military occupation of a large part of France made France's hold on its overseas possessions, including Indochina, difficult. The colonial administration was now cut off from outside help and outside supplies. After the Japanese invasion of Indochina in September 1940, the French were forced to allow Japan to set up military bases. This seemingly subservient behaviour convinced the Phibun regime that France would not seriously resist a confrontation with Thailand. The French military forces in Indochina consisted of an army of approximately 50,000 men, 12,000 of whom were French, organised into forty-one infantry battalions, two artillery regiments, and a battalion of engineers. The most obvious deficiency of the French army was its shortage of armour. 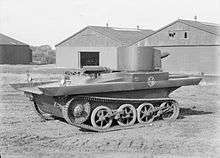 It could field only 20 Renault FT tanks against the nearly one hundred armoured vehicles of the Royal Thai Army. 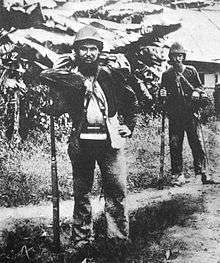 The bulk of the French forces stationed near the Thai border consisted of the Indochinese troops of the 3rd and 4th Tirailleurs Tonkinois, together with a battalion of Montagnards, French regulars of the Colonial Infantry, and French Foreign Legion units. The Armée de l'Air had approximately 100 aircraft, of which about 60 could be considered front line. These included thirty Potez 25 TOE reconnaissance/light bombers, four Farman 221 heavy bombers, six Potez 542 bombers, nine Morane-Saulnier M.S.406 fighters, and eight Loire 130 reconnaissance/bombers flying boats. The slightly larger Thai Army was a relatively well-equipped force. Consisting of 60,000 men, it was made up of four armies. 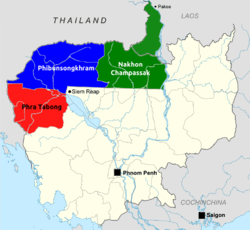 The largest was the Burapha Army with five divisions and the Isan Army with three divisions. Independent formations under direct control of the army high command included two motorised cavalry battalions, one artillery battalion, one signals battalion, one engineer battalion, and one armoured regiment. The artillery was a mixture of Krupp guns and modern Bofors guns and Howitzers, while 60 Carden Loyd tankettes and 30 Vickers 6-ton tanks made up the bulk of the army's tank force. The Royal Thai Navy included two coastal defence ships, 12 torpedo boats, and four Japanese-made submarines. The Thai navy was inferior to the French naval forces, but the Royal Thai Air Force held both a quantitative and qualitative edge over the local Armée de l'Air units. Among the 140 aircraft that composed the air force's first-line strength were 24 Mitsubishi Ki-30 light bombers, nine Mitsubishi Ki-21 medium bombers, 25 Curtiss Hawk 75N pursuit fighter planes, six Martin B-10 medium bombers, and 70 Vought O2U Corsair observation aircraft. On 5 January 1941, following the report of a French attack on the Thai border town of Aranyaprathet, the Thai Burapha and Isan Armies launched an offensive on Laos and Cambodia. French response was instantaneous, but many units were simply swept along by the better-equipped Thai forces. The Thai army swiftly overran Laos, but the French forces in Cambodia managed to rally and offer more resistance. At dawn on 16 January 1941 the French launched a large counterattack on the Thai-held villages of Yang Dang Khum and Phum Preav, initiating the fiercest battle of the war. Due to poor co-ordination and non-existent intelligence against the entrenched and prepared Thai forces, the French operation was stopped and fighting ended with a French retreat from the area. However, the Thais were unable to pursue the retreating French, as their forward tanks were kept in check by the gunnery of French Foreign Legion artillery. With the situation on land rapidly deteriorating for the French, Admiral Decoux ordered all available French naval forces into action in the Gulf of Thailand. In the early morning of 17 January, a French naval squadron caught a Thai naval detachment by surprise at anchor off Ko Chang island. The subsequent battle of Ko Chang was a victory for the French and resulted in the sinking of two Thai torpedo boats and the disabling of a coastal defence ship, with the French suffering only minor casualties. Fearing the war would turn in France's favour, the Japanese intervened, proposing an armistice be signed. The resolution of the conflict was received with wide acclaim among the Thai people and was seen as a personal triumph for Phibun. For the first time, Thailand had been able to extract concessions from a European power, albeit a weakened one. For the French in Indochina, the conflict was a bitter reminder of their isolation following the Fall of France. In the French view, an ambitious neighbour had taken advantage of a distant colony cut off from her weakened parent. Without hope of reinforcements, the French had little chance of offering a sustained resistance. However, the real beneficiaries of the conflict were the Japanese. They were able to expand their influence in both Thailand and Indochina. The Japanese won from Phibun a secret verbal promise to support them in an attack on British Malaya and British Burma (though he later would go back on his word). On 8 December 1941, the Japanese invaded Thailand at the same time they invaded Malaya (immediately before the attack on Pearl Harbor because of the International Date Line. Pearl Harbor was attacked one and a half hours after Malaya and Thailand). To commemorate the victory Phibun had the Victory Monument built. Thailand invited Japan and Germany to join the celebration. Japan ordered Shōjirō Iida to join the celebration and The German Foreign Ministry ordered Robert Eyssen to join the celebration. Central Market, Phnom Penh before Thai air raid. The French army suffered a total of 321 casualties, of whom 15 were officers. The total number of missing after 28 January was 178 (six officers, 14 non-commissioned officers, and 158 enlisted men). The Thais had captured 222 men (17 North Africans, 80 Frenchmen, and 125 Indochinese). The Thai army suffered 54 men killed in action and 307 wounded. 41 sailors and marines of the Thai navy were killed, and 67 wounded. 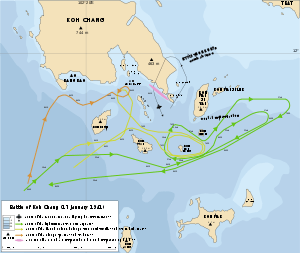 At the Battle of Ko Chang, 36 men were killed, of whom 20 belonged to HTMS Thonburi, 14 to HTMS Songkhla, and two to HTMS Chonburi. The Thai air force lost 13 men. The number of Thai military personnel captured by the French numbered just 21. About 30 percent of French aircraft were rendered unserviceable by the end of the war, some as a result of minor damage sustained in air raids that remained unrepaired. The Armée de l'Air admitted the loss of one Farman F221 and two Morane M.S.406s destroyed on the ground, but in reality its losses were greater. In its first experience of combat, the Royal Thai Air Force claimed to have shot down five French aircraft and destroyed 17 on the ground, for the loss of three of its own in the air and another five to 10 destroyed in French air raids on Thai airfields. ↑ Fall, p.22. "On the seas, one old French cruiser sank one-third of the whole Thai fleet ...,Japan, seeing that the war was turning against its pupil and ally, imposed its "mediation" between the two parties." ↑ Fall, Bernard B. (1994). Street Without Joy: The French Debacle in Indochina. Stackpole Books. ISBN 0-8117-1700-3. ↑ Windrow, Martin (2004). The Last Valley. Weidenfeld and Nicolson. ISBN 0-306-81386-6. 1 2 3 4 Royal Thai Air Force. (1976) The History of the Air Force in the Conflict with French Indochina. Bangkok. 1 2 Sorasanya Phaengspha (2002) The Indochina War: Thailand Fights France. Sarakadee Press. ↑ Stone, Bill. 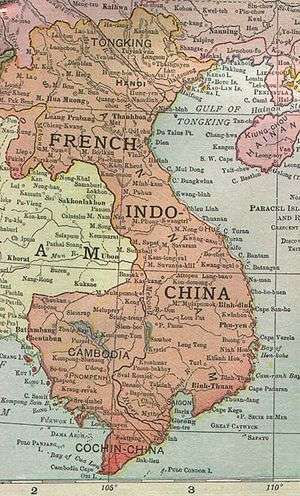 "Vichy Indo-China vs Siam, 1940-41". 1 2 3 Ehrengardt, Christian J; Shores, Christopher (1985). L'Aviation de Vichy au combat: Tome 1: Les campagnes oubliées, 3 juillet 1940 - 27 novembre 1942. 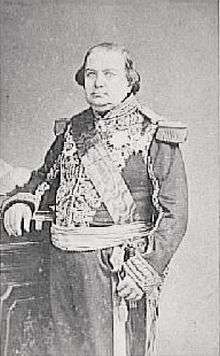 Charles-Lavauzelle. 1 2 3 Hesse d'Alzon, Claude (1985). La Présence militaire française en Indochine. Vincennes: Publications du service historique de l'Armée de Terre. 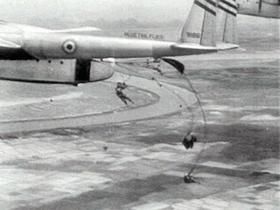 1 2 3 4 5 Young, Edward M. (1995) Aerial Nationalism: A History of Aviation in Thailand. Smithsonian Institution Press. ↑ Elphick, Peter. (1995) Singapore: the Pregnable Fortress: A Study in Deception, Discord and Desertion. Coronet Books. ↑ Charivat Santaputra (1985) Thai Foreign Policy 1932-1946. Thammasat University Press. ↑ Terwiel, B.J. (2005) Thailand's Political History: From the Fall of Ayutthaya to Recent Times. River Books.